And it's not just any random colors here, they actually took the time to get Crayola branding on this one. 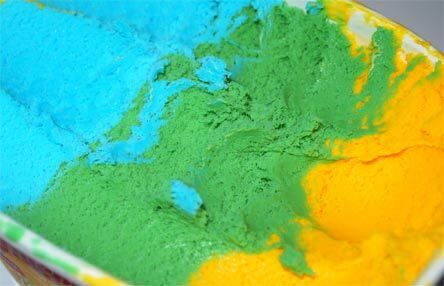 I'm not sure if it's genius or madness, but it goes well with their new Crayola ice cream cake that comes with "decorating pouches which consist of rainbow colored confetti shapes, yellow sprinkles, green sprinkles, blue icing, (and) red icing". That's right, Crayola is a #FunFactor. And it looks like Play Doh! Well, it may look like playdoh, and the colors will mess with your mind, but yeah, it's still just vanilla. Well, a very sweet vanilla that is. Texture is a little gummy and there's no mix-ins to distract you from it. It's not frozen dairy dessert gummy, but it is kind of annoying me more and more as I continue eating. There just seems to be some kind of ingredient funk building up as I reach the end of the bowl. Yeah, I think I just figured out the verdict on this one. If you want to try this one once to see what kind of smile it puts on the kids' faces, that's fine. However, as I stare at my empty bowl, I can't say I have any urge to buy this again. I do think I will grab a glass of water though. On Second Scoop: why bother, it's vanilla. Yeah, it doesn't get any better on subsequent scoopings. Buy Again? nah updating to no chance of repurchase. My daughter is refusing to eat it (and this coming from the girl who loves cotton candy ice cream). 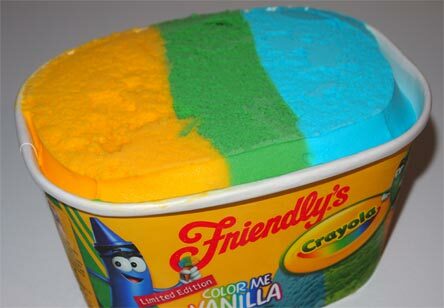 I have to give Friendly a lot of credit for trying to pull off something new and exciting and while it does look cool and fun, I don't think they should have used these colors for straight up vanilla but maybe instead for a birthday cake flavor. 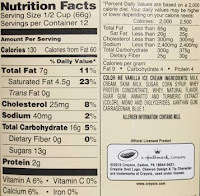 Vanilla was meant to be white and the colors just don't match the flavor. This reminds me of green ketchup and we both know how short-lived it turned out to be. This doesn't advertise well for me. 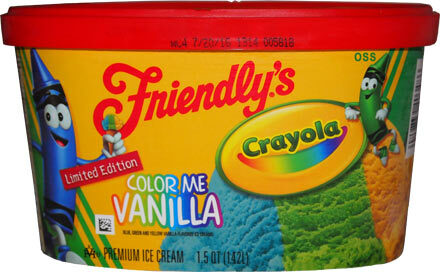 When I see a box like this, the immediate thought that comes to my mind is, "Why would I want a waxy crayon flavored ice cream?" What's next? Elmer's Glue branded ice cream? Completely agreed. My brain tells me it would literally be like eating a box of crayons. Although to be fair, there are some kids who eat crayons and paste. We all remember those kids, don't we? Don't know. My 6 year old took one look and said he wanted that ice cream tongue out and all...they know their demographic. I told him it was vanilla and he said, "And it's colored!" My wife thinks I am crazy but I may be the only person that wants to taste a "Play Doh" ice cream. I can still smell the smell from my childhood. No I never ate it but Im an adult now :) Trying to relive the moments I missed out on when I was a child. Even though I haven't found this or tried it yet, this is not the color vanilla is supposed to be. It is supposed to be white, not yellow, green, or blue. 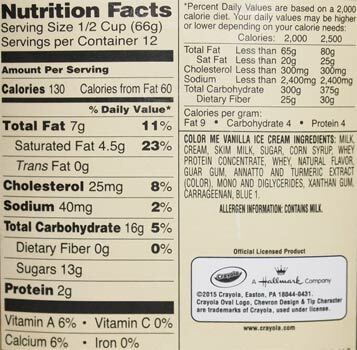 The aftertaste of the artificial coloring can get in the way of the vanilla flavor. Turned my poop greenish blue.